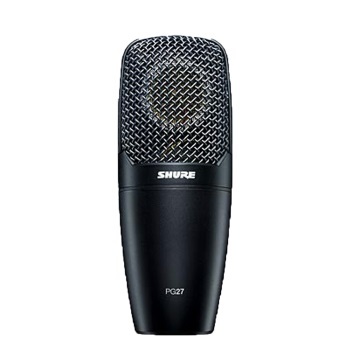 Designed with a flat frequency response for natural reproduction, the PG27 side-address microphone features a large diaphragm and a high SPL threshold that handles a wide variety of acoustic, amplified and vocal sound sources - with professional clarity and guaranteed Shure quality in every application. The PG27 includes a Stand Adapter and Zippered Pouch. Large diaphragm capsule provides wider dynamic range for clear highs and strong lows. Flat, neutral frequency response for natural reproduction of sound sources. High SPL handling of acoustic, amplified and vocal sound sources. -20dB switchable attenuator for additional SPL versatility.